I've saved writing this review until just the last minute. When I saw Practicing Affirmation : God-Centered Praise of Those Who Are Not God pop up on Crossway Books new release list, I knew I should read it. (Note: I did not say that I was overjoyed to read it. I said I knew I should.) You know. Those books that convict you just by reading the title alone? Yup. This is one for me! I'll be honest and tell you that I still do NOT want to talk about it because it is a very personally convicting read. I was sitting in a chair reading this book and Jonathan walked through the room. Me: "You should feel affirmed because I'm reading this book in the first place." Jonathan: "Oh, just the sight of you sitting there holding the book is very affirming." Now, when I first opened this book I was afraid it was going to be all, "Carrie, you need to be affirming! You need to say complimentary things to everyone about everything no matter what!" (I typically roll my eyes when thinking that someone needs to be praised for say, doing their duty in any form or fashion. I like the idea of duty and responsibility and you just "do what you gotta do." When I see someone acting responsibly, I generally feel fantastic things towards them and when I see laziness I just lose interest completely.) That's not what Crabtree is arguing for at all. He isn't saying, "compliment" for anything at all. What he is saying is that we should affirm the attributes of God that we see reflected in the lives of others. For example: say you see your son cleaning his room without being told, putting things in order. Crabtree would say to affirm that behavior in the son, but not just by saying, "Hey, good job." (And then thinking to yourself, "Whew! I didn't have to nag!") Instead he says to say to the son, "Son, I just wanted to let you know that I noticed you are cleaning your room and putting things in order without being told. I love that you are showing obedience and respect for others in the family without being specifically requested to do so. Furthermore, it pleases God to see you putting things in order, for He is a God of order." Ok, that might sound weird at first but can you see how it affirms the godly character without showering the individual with praise that puffs one up with pride? It doesn't put the receiver of the praise in a position to have to think of a way to deflect your praise but it does position them to understand what character qualities are good to develop to make them more Christ-like in all that they say and do. This is affirmation I can "buy" into. What I dislike (and yes, roll my eyes at) is when you see a bunch of people get together and compliment each other's looks. "You're hair is so beautiful!" "I love that skirt you are wearing!" "You look hot!" "You are amazing!" None of these things point out godly character qualities. They are surface level compliments and I have never known what to make of them because they feel so very false to me, personally. But I DO like it when I hear things like, "There's just something about you today....when I look at you I can see the enthusiasm for life that God has placed within you." Or perhaps, "God created you so beautifully!" (Not that He didn't create each one of us beautifully, but you catch my drift, I hope.) There is a right way and a wrong way to bestow an affirmation - to say something of meaning and worth that will have a positive impact in that it will push the person closer to Christ instead of closer to their own foolish pride. And that is the point of this book. I think Practicing Affirmation is a good admonishment in a society full of Facebook compliments. (And if you're at all familiar with Facebook, you know what I'm talking about.) Defined by me: empty, hollow words with little to no meaning scattered about liberally, giving soft pats on our backs instead of good solid food for our soul's health. In this book, author Sam Crabtree first points out that it is Biblically required that we affirm one another. Affirmation is not a bad thing and should not be avoided. Rather, it should be genuinely practiced. (Hence the title.) He is anti-hollow praise and pro-spirit driven praise. I know and you know people who toss about compliments like they are going out of style. This always serves to drive me crazy because when the compliment is directed at me it feels hollow and I'm left with the numb feeling of believing that the person never truly cared to say a nice word to me at all. I find myself thinking that they just wanted to somehow make themselves feel good by spouting off a bunch of hoo-ha about me that isn't necessarily true. There is a false feeling about them. Thoughtless compliments like, "You are so awesome" do absolutely nothing for me. Or, "I really like you." (To which I then think in my head, "Yeah, you like me now but what about in 15 minutes when I do something to annoy you? What then?) I have always responded better to things like, "I really admire you for _______" because that feels like something that has substance and merit. As a result, knowing how they make me feel personally, I tend to hold back compliments/affirmation myself. When I do say that someone or something is remarkable, I want it to hold some weight. My problem is that I hold back the affirmations to the point of practically starving those around me. I should be more free in my affirmations. There are genuinely things I could affirm but choose not to for the fear of sounding false. That's no excuse. I did appreciate the emphasis that Crabtree places on making sure your affirmations are honest and not just a desire to please yourself by making other people around you like you for always saying something positive. And I suppose I have to appreciate the kick in the pants I received to make sure the affirmations I could bestow actually pass through my lips instead of staying locked up in my head. They really don't serve much purpose in my head but could be of some benefit, voiced. "True affirmations are more likely to come out of a truly affirming heart, which is another reason why it's so important to be going hard after God, working out our salvation with fear and trembling, pursuing holiness, and asking God to transform us from the inside out. Gordon Cheng put it well: "People who genuinely encourage other people are not putting it on. It comes out of who they are - or better, who God has made them." (page 68). I think, for myself, I have to live with this book. 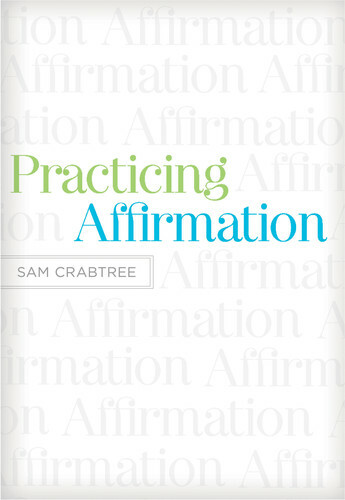 Sam Crabtree presents an accurate truth that affirmations are necessary for building, keeping and maintaining relationships. I have been far too stingy in doling them out at times, even when I see things that are worth affirming. I have much to work on. My goal in working on them though is to always speak honestly (and fairly) with the ultimate motivation of building up someone's faith to point them towards the cross. That is the ultimate goal of any true, honest, or positive affirmation. Practicing Affirmation is flat out awesome. I will be pulling it out for frequent re-reads over the course of my lifetime because this is something that I do indeed struggle with. Whether you are rich with your compliments or are hoarding your affirmations, I think this book is worthy of time and attention. Dare to be convicted. Dare to change. THIS CONTEST IS NOW CLOSED. THE WINNER (as selected by random.org) IS #13 - Janine. CONGRATS! Um, I think I want to read this...but know that it will convict me too...differently than you, but still convicting. This book looks wonderful! I definitely need to read it--but I never win, giggle. Guess I'll be looking it up. This book is on my Kindle and will be on my SRT list. I do have some words of affirmation tendencies (and I'm one of those people who thrives on affirmation, but I know I have lots of room for improvement. This is on my WANT TO READ list! Sounds like one I could benefit from! I am a man of many words and too often I am more critical then I should be so I know this book would guide me in taking the right steps to being more affirmative than critical. What you wrote reminded me of Steven Curtis Chapman's song, "Fingerprints of God". I love complimenting people, but I would love *more* learning how to AFFIRM their godly characteristics, so I would like to win the book. Would love to win a copy of this book, got to your site via Crossway fb page. I guess I'm ready for conviction. :) I have been told I have the gift of encouragement, not sure my family members would say that is always true of me. I know I need help in affirming them! I have been wanting to read it and would love to win a copy. How often we affirm others with false affirmations. Telling them what we think they want to hear. We as a culture are much more likely to be critical of each others then affirming. This should be taught across the country in every church. I would like to teach it at our Church this summer. I'm not interested in the book, but I am curious about how it handles affirmation of people who are not Christian and affirmations that are not spiritual. When I worked in the fab, I read dozens of lot incident reports from operators. Some operators could relate the problem to other recent problems, do statistics, etc. Some operators were recent immigrants whose English was incomprehensible and I would have to go investigate the problem myself. However, quality of my reports went up as I kept track of which operators had which skills and what areas they could improve in. I was specific about what was good or what was a new improvement. As a parent, I try to do more of letting my children know what they did right than correcting them for what they do wrong, though both are necessary. I'm curious if this book spiritualizes something that, to me, is not necessarily a spiritual issue. Looks like an excellent book that I would love to read!!! I definitely need to read this !I really struggle with remembering to give affirmation. I always realize after the opportunity has passed that I missed it. OK, now I feel super cautious about anything I say to you that may be misconstrued as empty, meaningless, false and worldly. What I do want to say is that I love what this post revealed about your character. If I didn't know it before, I know now that I would love to be friends with you in real life! Not for you to praise or affirm me, of course :-) But because you live and speak and write of spiritual "meat", when there are so many out there who are satisfied with the shallow things of life. Would love to read this book. Thanks for letting us know about it! Sounds like something I need to add to my must read list. The opportunity to win it is great. I thought this was an excellent and inspiring review because you chose to genuinely discuss it with the sort of humility and genuineness that the rest of us can connect with and be convicted by. Some very good things would start happening if we were all this willing to be honest about our need for growth - and actually cared enough to work hard at it. Sounds like a book with some great things to say about how to navigate the Human Experience in a more God-honoring way. I tend to be the one whose words of affirmation are on the end of "you're awesome" or "i really like you." :) But I don't speak these words to close friends or family...I speak them to acquaintances that may not really know me all that well and I am afraid of what they migh think of me if I go "over the top" with my "affirmation". This book sounds like something I would really benefit from reading! Don't put me in for the drawing. It might be an interesting read but I just have too much else stacked up right now. And it seems the scales on this have tipped generally overboard in society, at least among some. Once in a children's ministry group, the youth pastor had to say something corrective to another worker. She was very hurt and said, "You know how when you criticize someone, you're supposed to sandwich it in between saying two nice things? He didn't do that!" While I agree that's a good practice, sometimes in the midst of things you need to be able to just tell a person something needs to be done, or done differently, and have them be mature enough to just make the adjustments. And I always go back to Luke 17:7-10 and Col 3:22-24 -- I am supposed to do what I do as unto the Lord whether anyone else notices, much less affirms me. Carrie, I really like the way the Holy Spirit is able to use your honesty and humility to bless those of us who read your blog. You certainly reminded me that I can and should use words to bless and affirm those around me in whom God is doing a good work. I enjoyed your review and would love to read Practicing Affirmation :) *Thanks* for the giveaway! I definitely could use a book like this! (understatement) Please enter me. Words of affirmation is just under Quality Time in my Love Language preference...I want to read this book. Thanks for considering me in your book giveaway! I do thrive on words of affirmation. After taking the languages of love profile, we also learned that it is my husband's prferred love language. But for some reason, we both act with gifts of service toward one another. Yes, I need to read this book! This sounds like a great book! Please enter me.